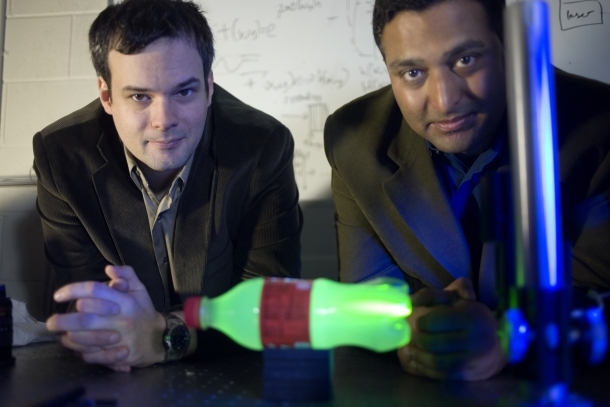 Media Lab postdoc Andreas Velten, left, and Associate Professor Ramesh Raskar with the experimental setup they used to produce slow-motion video of light scattering through a plastic bottle. CAMBRIDGE, Mass. — MIT researchers have created a new imaging system that can acquire visual data at a rate of one trillion exposures per second. That’s fast enough to produce a slow-motion video of a burst of light traveling the length of a one-liter bottle, bouncing off the cap and reflecting back to the bottle’s bottom. The image produced by the camera is thus two-dimensional, but only one of the dimensions — the one corresponding to the direction of the slit — is spatial. The other dimension, corresponding to the degree of deflection, is time. The image thus represents the time of arrival of photons passing through a one-dimensional slice of space. 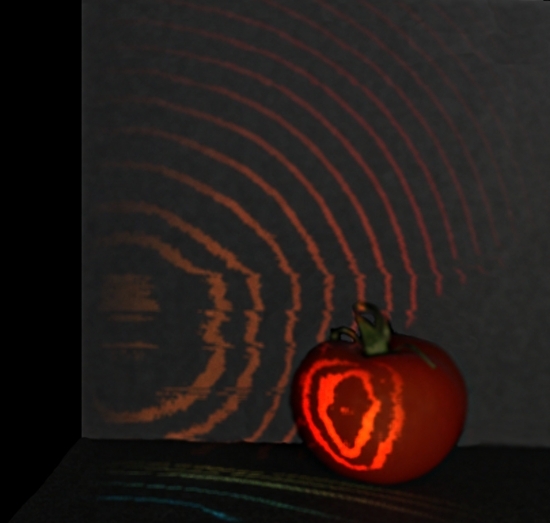 One of the things that distinguishes the researchers' new system from earlier high-speed imaging systems is that it can capture light 'scattering' below the surfaces of solid objects, such as the tomato depicted here. After an hour, the researchers accumulate hundreds of thousands of data sets, each of which plots the one-dimensional positions of photons against their times of arrival. Raskar, Velten and other members of Raskar’s Camera Culture group at the Media Lab developed algorithms that can stitch that raw data into a set of sequential two-dimensional images. The streak camera and the laser that generates the light pulses — both cutting-edge devices with a cumulative price tag of $250,000 — were provided by Bawendi, a pioneer in research on quantum dots: tiny, light-emitting clusters of semiconductor particles that have potential applications in quantum computing, video-display technology, biological imaging, solar cells and a host of other areas. The trillion-frame-per-second imaging system, which the researchers have presented both at the Optical Society's Computational Optical Sensing and Imaging conference and at Siggraph, is a spinoff of another Camera Culture project, a camera that can see around corners. That camera works by bouncing light off a reflective surface — say, the wall opposite a doorway — and measuring the time it takes different photons to return. But while both systems use ultrashort bursts of laser light and streak cameras, the arrangement of their other optical components and their reconstruction algorithms are tailored to their disparate tasks. Because the ultrafast-imaging system requires multiple passes to produce its videos, it can’t record events that aren’t exactly repeatable. Any practical applications will probably involve cases where the way in which light scatters — or bounces around as it strikes different surfaces — is itself a source of useful information. Those cases may, however, include analyses of the physical structure of both manufactured materials and biological tissues — “like ultrasound with light,” as Raskar puts it.